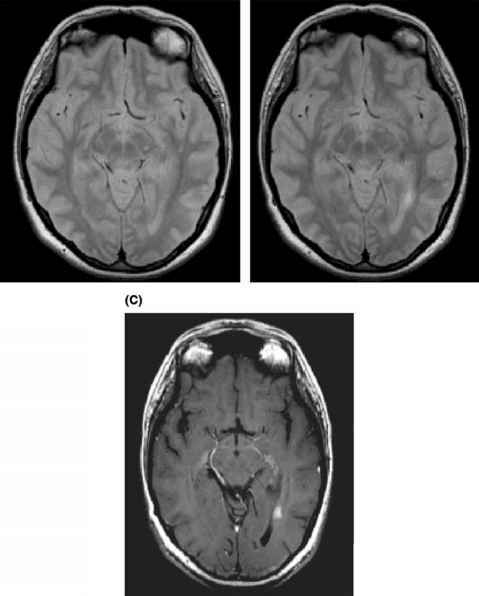 NMO is an idiopathic inflammatory CNS demyelinating disease characterized by either monophasic or relapsing attacks of optic neuritis and myelitis. Pathologically, NMO lesions demonstrate extensive demyelination across multiple spinal cord levels, associated with necrosis and cavitation, as well as acute axonal damage in both gray and white matter. There is a pronounced loss of oligodendrocytes within the lesions, and inflammatory infiltrates are comprised of large numbers of macrophages associated with large numbers of perivascular granulocytes and eosinophils, as well as rare CD3+ and CD8+ T-cells. A pronounced vasculocentric deposition of immunoglobulin and complement C9 neo antigen is associated with prominent vascular fibrosis and hyalinization in both active and inactive lesions (Figure 13) (155). These findings implicate a potential role for specific autoantibody and local activation of complement in this disorder's pathogenesis. This hypothesis is supported by serologic and clinical evidence of B-cell autoimmunity in a high proportion of patients with NMO (156). Figure 13 (See color insert.) Devic disease. 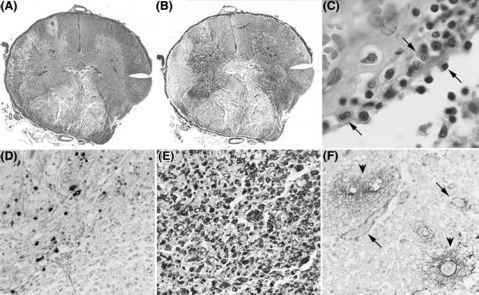 The pathology of neuromyelitis optica reveals lesions with extensive demyelination across multiple spinal cord levels, associated with acute axonal injury, necrosis, and cavitation, involving both gray and white matter (A, B). Inflammatory infiltrates of active lesions are associated with large numbers of perivascular granulocytes and eosinophils (C), as well as extensive macrophage infiltration (E) and rare CD3+ and CD8+ T-lymphocytes. There also is a pronounced loss of oligodendrocytes within the lesions (D). Actively demyelinating lesions demonstrate a characteristic rim (arrows) and rosette (arrowheads) pattern of immunoglobulin deposition and complement activation surrounding blood vessels (F). Source: From Ref. 164.
optica from MS (157). The staining pattern of patients' serum IgG binding to mouse spinal cord is remarkably similar to the vasculocentric pattern of immunoglobulin and complement deposition. Sensitivity and specificity for this autoantibody are 73% (95% CI = 60-86%) and 91% (95% CI = 79-100%) for neuromyelitis optica in North American patients, and 58% (95% CI = 30-86%) and 100% for opticospinal MS in Japanese patients (157). NMO-IgG binds selectively to aquaporin-4, the predominant water channel protein in the CNS (158).